Nestled at the perfect midway point, between the North Carolina corn and tobacco fields, and the Smithfield urban area, home to outlet malls and restaurants, RBC Show Horses, LLC was established in November, 2007. The fourteen-acre, forty-stall Arabian horse training facility represents the accumulative experience and success of one of the top training teams in the country, Rob Bick and Caralyn Schroter. The farm, itself, is a perfect, peaceful setting for training horses and riders. The forty stall barn is supplemented by a covered, enclosed riding arena, as well as a bull pen, walker, and turnouts. 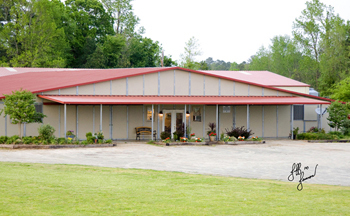 Having originally been a reining horse facility, there is also a huge 300 x 200 reining track. While, as Rob puts it, “The farm is a nice, neat package,” it is the partnership of Rob and Caralyn that is the real substance of the facility. Recognized as Nationally accomplished and successful individuals, their teamwork makes them doubly formidable in the show ring. Rob and Caralyn took different paths in their Arabian horse experience, but had similar roots that, perhaps, contributed to the strength of their partnership. Both grew up with large families on dairy farms, comfortable doing chores, milking cows, and driving farm vehicles. Neither is a stranger to hard work! When both Rob and Caralyn decided that Holsteins were not their future, they began their journeys that would ultimately lead them to join forces in the Arabian horse industry. Rob left his home in Montana to join Murrell Lacey’s apprenticeship program at Rogers Arabians in California. There Rob learned not only how to ride horses, but to train them as well. From Murrell Lacey’s program, Rob worked with various Arabian facilities, including Glen Wilson, Southern Cross, Nicasio Valley, Palo Verde Arabians, and Castle Rock Arabians. Through a connection with Mustafa Sabankaya, Rob met Ray LaCroix, and it was through his work with Ray that Rob put the finishing touches on his training abilities. Rob eventually moved to Walnut Creek, California, where he established Pacific Park, a public training facility. When Rob left LaCroix’s, Caralyn stepped in to fill his position, there. 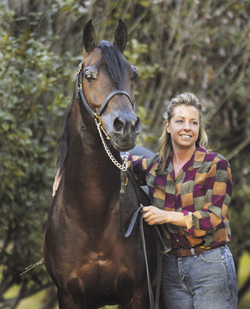 She had been working for trainers such as Pam Zimmerman and Michael Whelihan when she heard of the open position at LaCroix, Ltd. Caralyn remained there for over three years, working with amateurs, and riding and training horses. From there, Rob hired her to work with him at Pacific Park, and in 1992, the force that is now their partnership was formed! In fact, the partnership worked out so well, two years later, Rob and Caralyn were married! 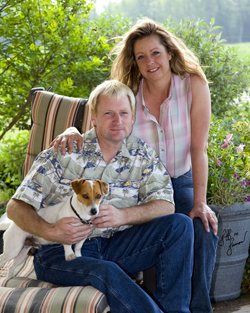 In 1996, Rob and Caralyn were offered the opportunity to move to North Carolina to work for Dolorosa Arabians. For eleven years there, they trained both farm-owned and outside client horses. “At Dolorosa,” Rob explains, “we were able to have input into the breeding program. In doing that, Dolorosa won a Breeder of the Year award, and we had the opportunity to succeed with horses we had ‘hatched out’ ourselves. And trained. And showed.” Included in those was DA Lightning Jack, the very first horse that Rob broke to ride at Dolorosa. DA Lightning Jack has earned seven National Championships in U.S., Canadian, and Youth National competition in his lifetime. 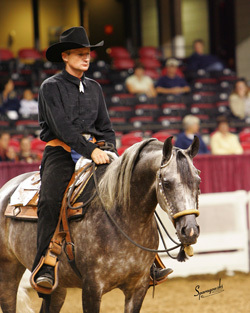 Caralyn trained DA Josiah to a Canadian National Championship and U.S. Reserve, while DA Trinidad won the U.S. National English Pleasure Futurity with Rob. “We were able to develop a really great group of clients as well,” Rob adds. For example, Caralyn had tremendous success with horses bred by Claire Boyd – CBS Top Dog, winner of multiple National and Reserve National Championships; National Champion, CBS Bahznia; and CBS Watusi, winner of many Regional Championships and National Top Tens. Rob and Caralyn live in their home just 200 yards from the barn and laughingly refer to themselves as the “live-in help.” They are completely hands-on. Caralyn takes care of the office and bookkeeping end of it, while Rob does most of the maintenance. In between, they share the training and amateur work. And not only do they show in a variety of divisions, but they succeed in them at the National level. Rob and Caralyn have been able to show halter horses and in their many performance disciplines – all to success at the National level. It is a strong point that many barns don’t enjoy. Hauling the horses themselves in their 15-horse and 4-horse rigs, Rob and Caralyn show all the way from February through November. “We are in Region 12 so the Region 12 show is one to which we take a strong group of horses. We try to go to one or two other regionals and like to go all over the Eastern United States. We attend Youth Nationals, Canadian Nationals, U.S. Nationals, Scottsdale and the Buckeye, and love going down to the Tampa Thanksgiving Show in November. Rob Bick, Caralyn Schroter, and RBC Show Horses represent the pride of ownership, a commitment to the care and education of clients and their horses, and the unique advantages of a strong, versatile team. Where one is good, two are definitely better! Home in Smithfield, North Carolina, RBC Show Horses is a place where people and horses can enjoy learning together; achieving their goals, and having friendship and support along the way to their success!